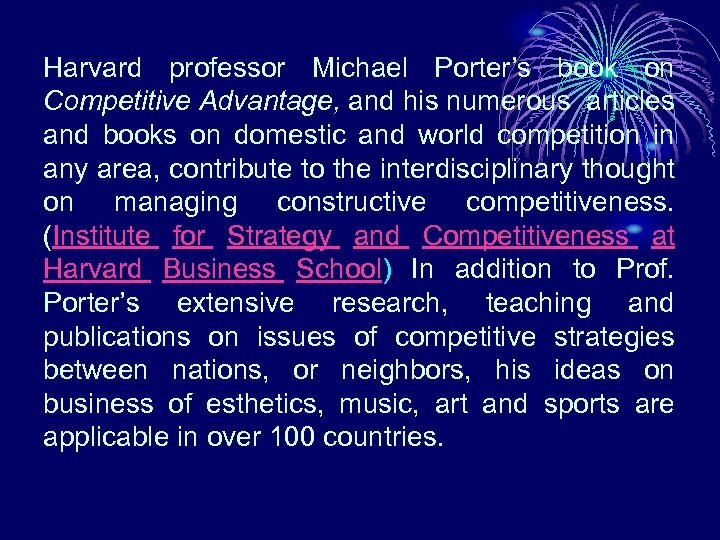 Harvard professor Michael Porter’s book on Competitive Advantage, and his numerous articles and books on domestic and world competition in any area, contribute to the interdisciplinary thought on managing constructive competitiveness. (Institute for Strategy and Competitiveness at Harvard Business School) In addition to Prof. Porter’s extensive research, teaching and publications on issues of competitive strategies between nations, or neighbors, his ideas on business of esthetics, music, art and sports are applicable in over 100 countries. 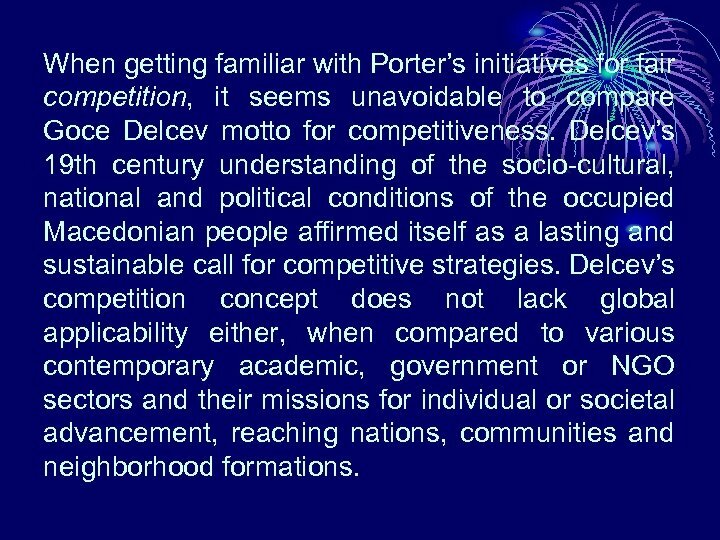 When getting familiar with Porter’s initiatives for fair competition, it seems unavoidable to compare Goce Delcev motto for competitiveness. Delcev’s 19 th century understanding of the socio-cultural, national and political conditions of the occupied Macedonian people affirmed itself as a lasting and sustainable call for competitive strategies. Delcev’s competition concept does not lack global applicability either, when compared to various contemporary academic, government or NGO sectors and their missions for individual or societal advancement, reaching nations, communities and neighborhood formations. 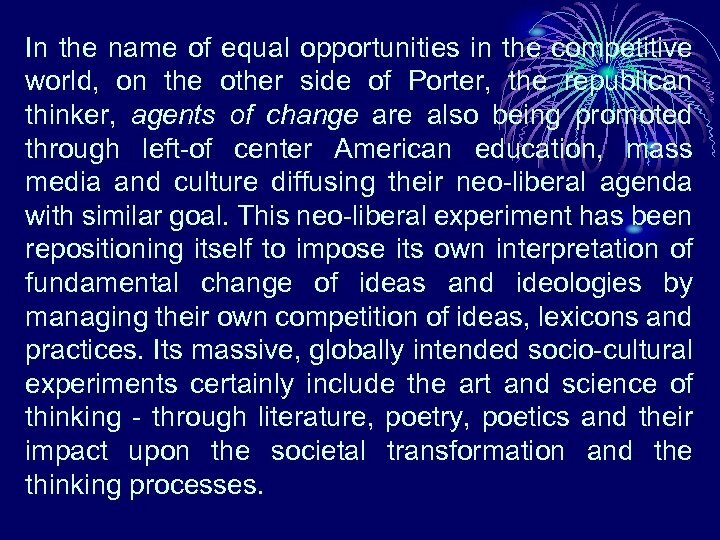 In the name of equal opportunities in the competitive world, on the other side of Porter, the republican thinker, agents of change are also being promoted through left-of center American education, mass media and culture diffusing their neo-liberal agenda with similar goal. This neo-liberal experiment has been repositioning itself to impose its own interpretation of fundamental change of ideas and ideologies by managing their own competition of ideas, lexicons and practices. Its massive, globally intended socio-cultural experiments certainly include the art and science of thinking - through literature, poetry, poetics and their impact upon the societal transformation and the thinking processes. 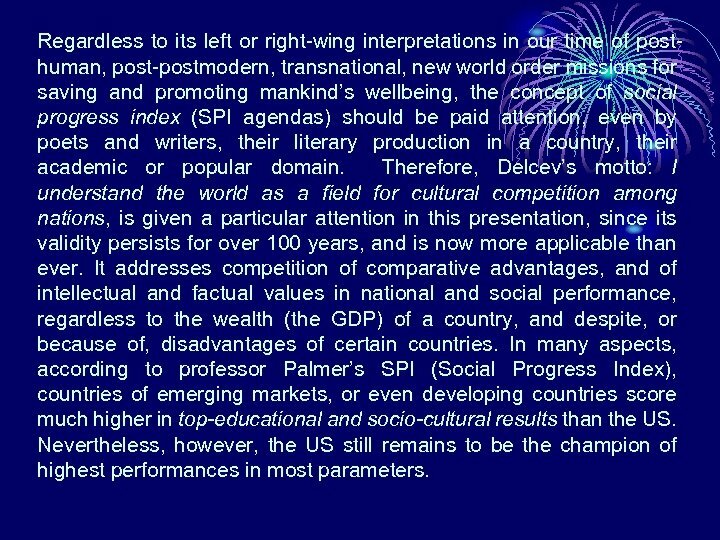 Regardless to its left or right-wing interpretations in our time of posthuman, post-postmodern, transnational, new world order missions for saving and promoting mankind’s wellbeing, the concept of social progress index (SPI agendas) should be paid attention, even by poets and writers, their literary production in a country, their academic or popular domain. Therefore, Delcev’s motto: I understand the world as a field for cultural competition among nations, is given a particular attention in this presentation, since its validity persists for over 100 years, and is now more applicable than ever. It addresses competition of comparative advantages, and of intellectual and factual values in national and social performance, regardless to the wealth (the GDP) of a country, and despite, or because of, disadvantages of certain countries. In many aspects, according to professor Palmer’s SPI (Social Progress Index), countries of emerging markets, or even developing countries score much higher in top-educational and socio-cultural results than the US. Nevertheless, however, the US still remains to be the champion of highest performances in most parameters. Within these parameters smaller societies and educational and cultural systems in the world could find their level of knowledge, skills or abilities worthy of consideration by the progress index, precisely because of their cultural and intellectual wealth. 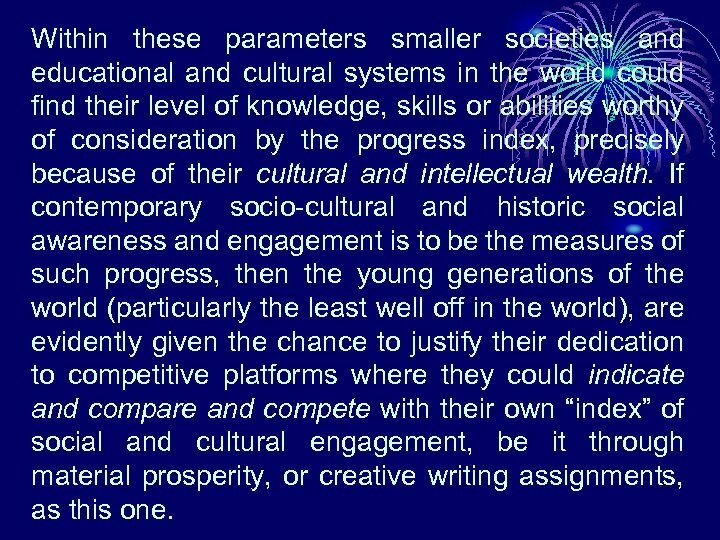 If contemporary socio-cultural and historic social awareness and engagement is to be the measures of such progress, then the young generations of the world (particularly the least well off in the world), are evidently given the chance to justify their dedication to competitive platforms where they could indicate and compare and compete with their own “index” of social and cultural engagement, be it through material prosperity, or creative writing assignments, as this one. 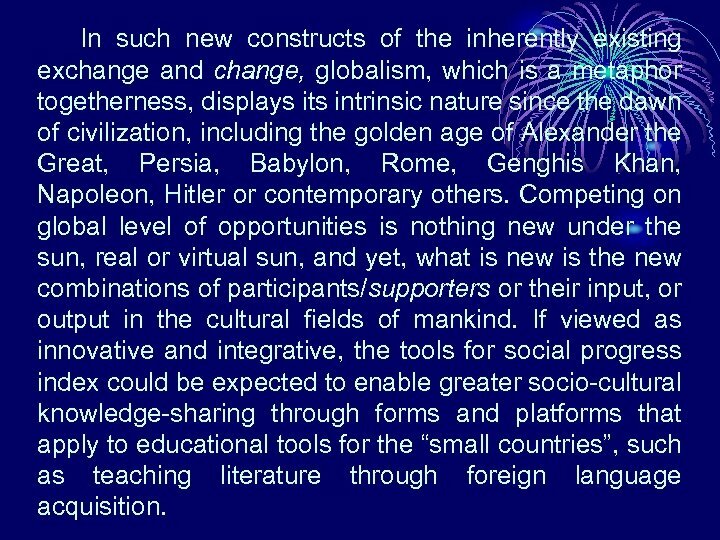 In such new constructs of the inherently existing exchange and change, globalism, which is a metaphor togetherness, displays its intrinsic nature since the dawn of civilization, including the golden age of Alexander the Great, Persia, Babylon, Rome, Genghis Khan, Napoleon, Hitler or contemporary others. Competing on global level of opportunities is nothing new under the sun, real or virtual sun, and yet, what is new is the new combinations of participants/supporters or their input, or output in the cultural fields of mankind. If viewed as innovative and integrative, the tools for social progress index could be expected to enable greater socio-cultural knowledge-sharing through forms and platforms that apply to educational tools for the “small countries”, such as teaching literature through foreign language acquisition. 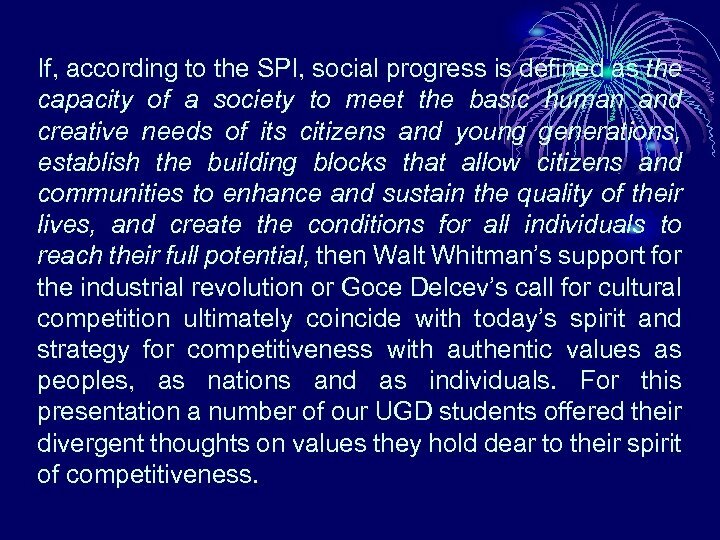 If, according to the SPI, social progress is defined as the capacity of a society to meet the basic human and creative needs of its citizens and young generations, establish the building blocks that allow citizens and communities to enhance and sustain the quality of their lives, and create the conditions for all individuals to reach their full potential, then Walt Whitman’s support for the industrial revolution or Goce Delcev’s call for cultural competition ultimately coincide with today’s spirit and strategy for competitiveness with authentic values as peoples, as nations and as individuals. For this presentation a number of our UGD students offered their divergent thoughts on values they hold dear to their spirit of competitiveness. 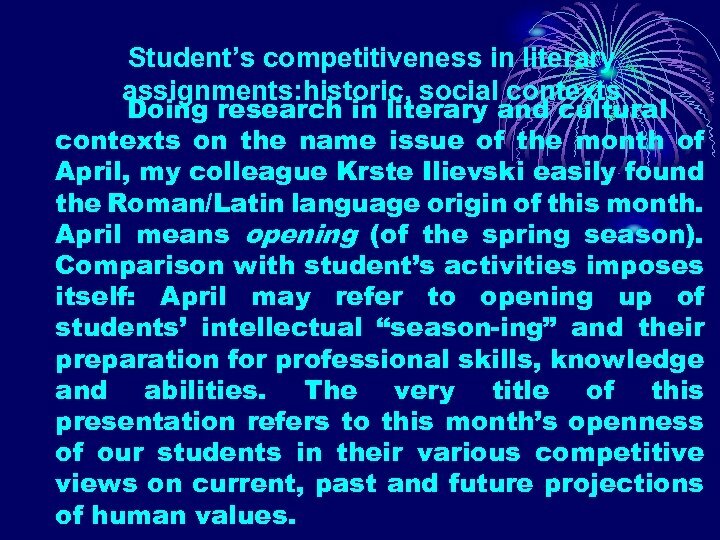 Student’s competitiveness in literary assignments: historic, social contexts Doing research in literary and cultural contexts on the name issue of the month of April, my colleague Krste Ilievski easily found the Roman/Latin language origin of this month. April means opening (of the spring season). Comparison with student’s activities imposes itself: April may refer to opening up of students’ intellectual “season-ing” and their preparation for professional skills, knowledge and abilities. The very title of this presentation refers to this month’s openness of our students in their various competitive views on current, past and future projections of human values. Thirty four undergraduate and graduate English literature students at the UGD School of Philology employed their imagination in both contemporary and historic, socio-cultural contexts. They sincerely opened up their reaction to the idea of love for their country and for the world as a whole. 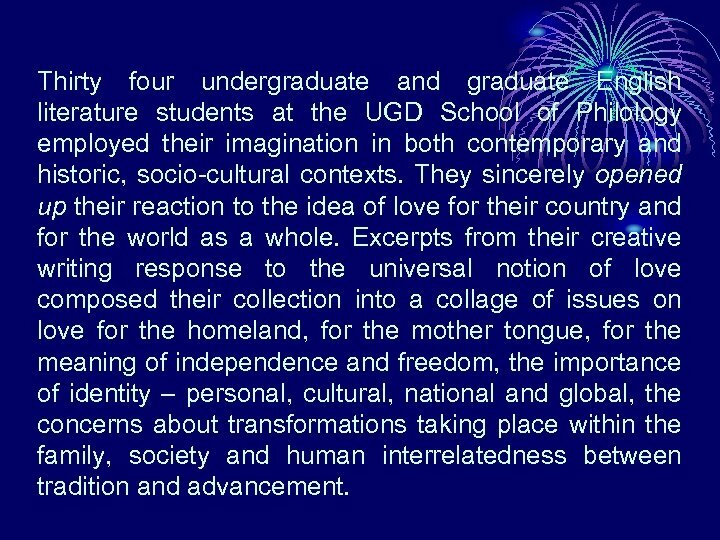 Excerpts from their creative writing response to the universal notion of love composed their collection into a collage of issues on love for the homeland, for the mother tongue, for the meaning of independence and freedom, the importance of identity – personal, cultural, national and global, the concerns about transformations taking place within the family, society and human interrelatedness between tradition and advancement. 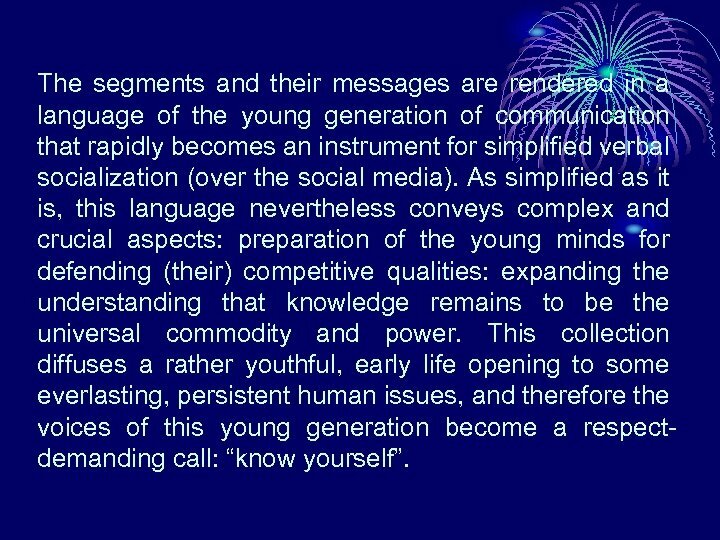 The segments and their messages are rendered in a language of the young generation of communication that rapidly becomes an instrument for simplified verbal socialization (over the social media). As simplified as it is, this language nevertheless conveys complex and crucial aspects: preparation of the young minds for defending (their) competitive qualities: expanding the understanding that knowledge remains to be the universal commodity and power. This collection diffuses a rather youthful, early life opening to some everlasting, persistent human issues, and therefore the voices of this young generation become a respectdemanding call: “know yourself”. 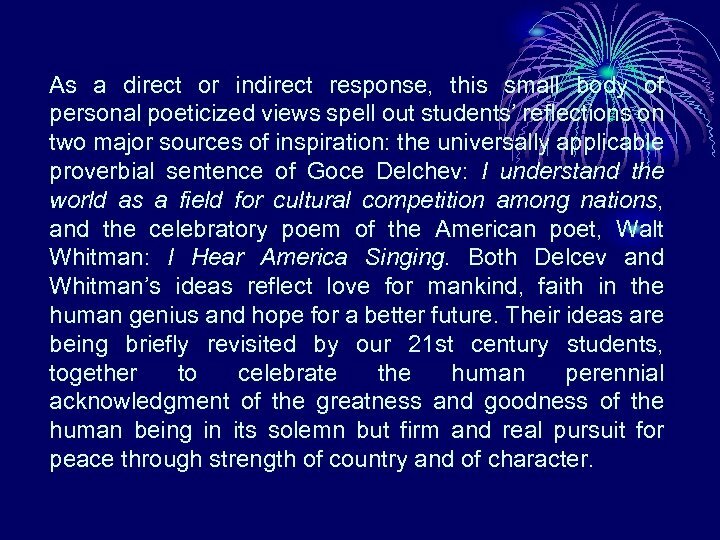 As a direct or indirect response, this small body of personal poeticized views spell out students’ reflections on two major sources of inspiration: the universally applicable proverbial sentence of Goce Delchev: I understand the world as a field for cultural competition among nations, and the celebratory poem of the American poet, Walt Whitman: I Hear America Singing. 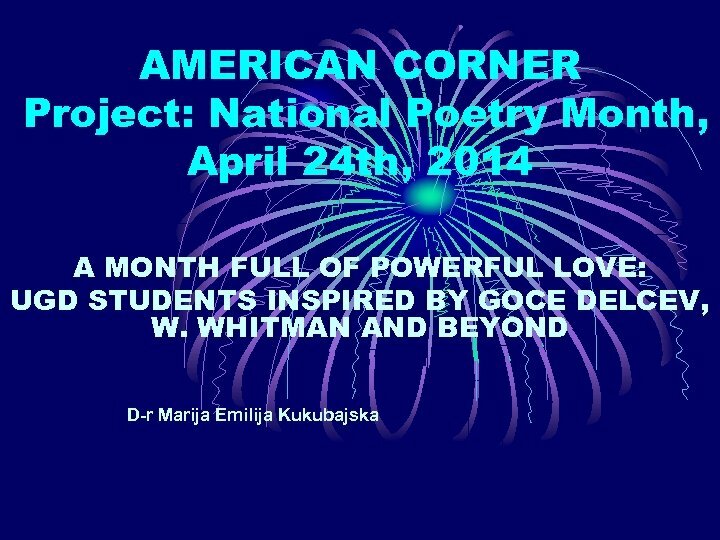 Both Delcev and Whitman’s ideas reflect love for mankind, faith in the human genius and hope for a better future. Their ideas are being briefly revisited by our 21 st century students, together to celebrate the human perennial acknowledgment of the greatness and goodness of the human being in its solemn but firm and real pursuit for peace through strength of country and of character. The students’ confidence in the prosperous future of their country extends from dedication to the constructive history-making, to the winning spirit and leadership of the current homelandbuilders. In their modest but sincere and direct expressions students address their views, needs and concerns over the advancement vs devaluation of human life in modern times. 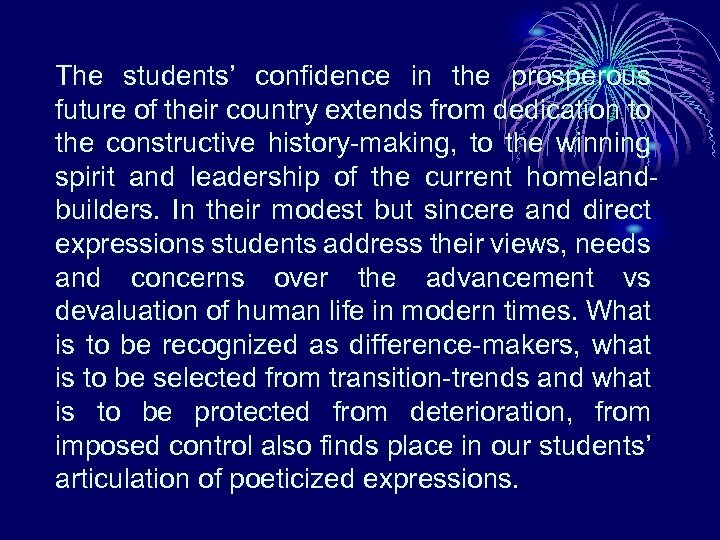 What is to be recognized as difference-makers, what is to be selected from transition-trends and what is to be protected from deterioration, from imposed control also finds place in our students’ articulation of poeticized expressions. Students review their expressive assignments in brief, sharp or tender, tones of lyrics, ballads, hymns and narrative reporting. They range from artful, mindful, didactic and informed braveheart seriousness to childlike naiveté or scholastic artlessness, as they all indicate levels of today’s variable state of awareness among the young generations of the world. In the end of this parade of fiction and non-fiction, conclusion is easily made: students impose respect for their original love and genuine devotion to what they believe in and transcribe in their own words as the essence of the grand idea: the invincible love for the Creator of the universe. 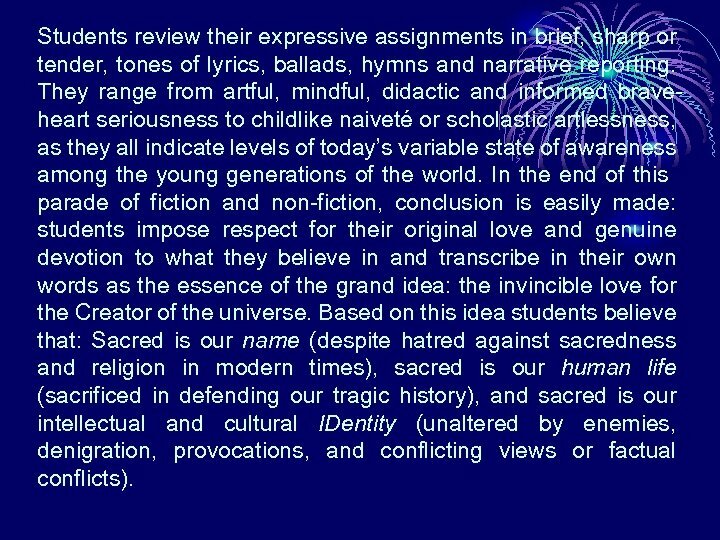 Based on this idea students believe that: Sacred is our name (despite hatred against sacredness and religion in modern times), sacred is our human life (sacrificed in defending our tragic history), and sacred is our intellectual and cultural IDentity (unaltered by enemies, denigration, provocations, and conflicting views or factual conflicts). One will be surprised to hear the 21 st century students stand against new forms of alienation despite of the social connectedness, to stand against new conflicts of cultures, ideologies, religions and other uncompromising divisions. 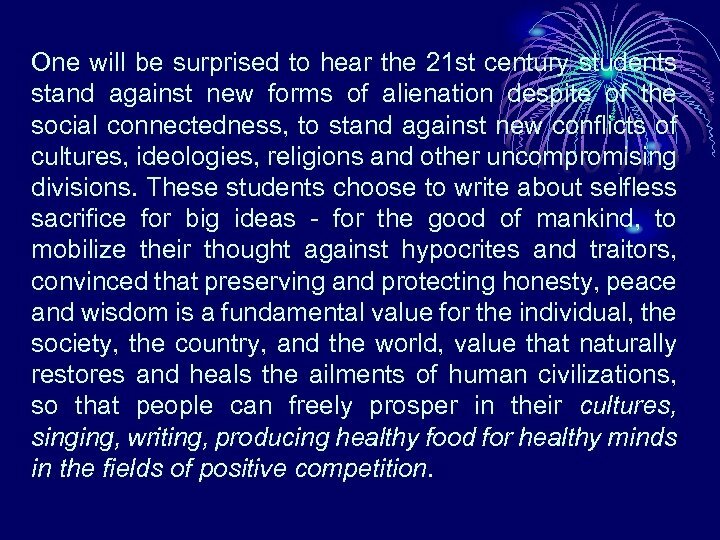 These students choose to write about selfless sacrifice for big ideas - for the good of mankind, to mobilize their thought against hypocrites and traitors, convinced that preserving and protecting honesty, peace and wisdom is a fundamental value for the individual, the society, the country, and the world, value that naturally restores and heals the ailments of human civilizations, so that people can freely prosper in their cultures, singing, writing, producing healthy food for healthy minds in the fields of positive competition. 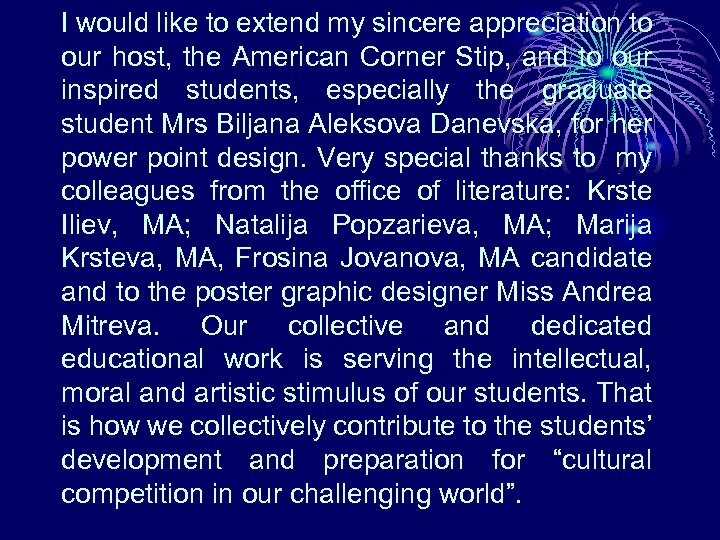 I would like to extend my sincere appreciation to our host, the American Corner Stip, and to our inspired students, especially the graduate student Mrs Biljana Aleksova Danevska, for her power point design. 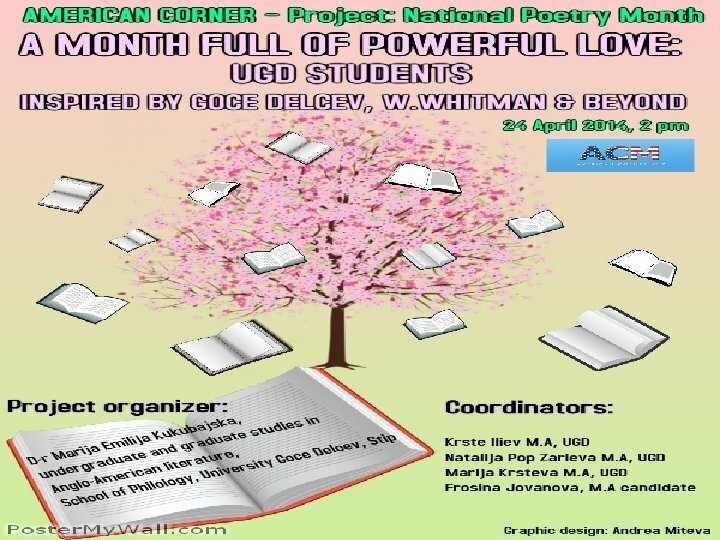 Very special thanks to my colleagues from the office of literature: Krste Iliev, MA; Natalija Popzarieva, MA; Marija Krsteva, MA, Frosina Jovanova, MA candidate and to the poster graphic designer Miss Andrea Mitreva. Our collective and dedicated educational work is serving the intellectual, moral and artistic stimulus of our students. That is how we collectively contribute to the students’ development and preparation for “cultural competition in our challenging world”. 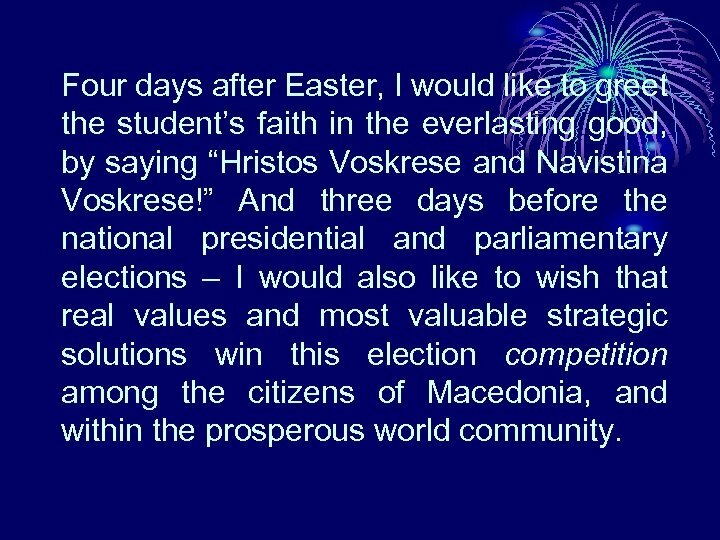 Four days after Easter, I would like to greet the student’s faith in the everlasting good, by saying “Hristos Voskrese and Navistina Voskrese!” And three days before the national presidential and parliamentary elections – I would also like to wish that real values and most valuable strategic solutions win this election competition among the citizens of Macedonia, and within the prosperous world community. Students participants in the presentation: 1. 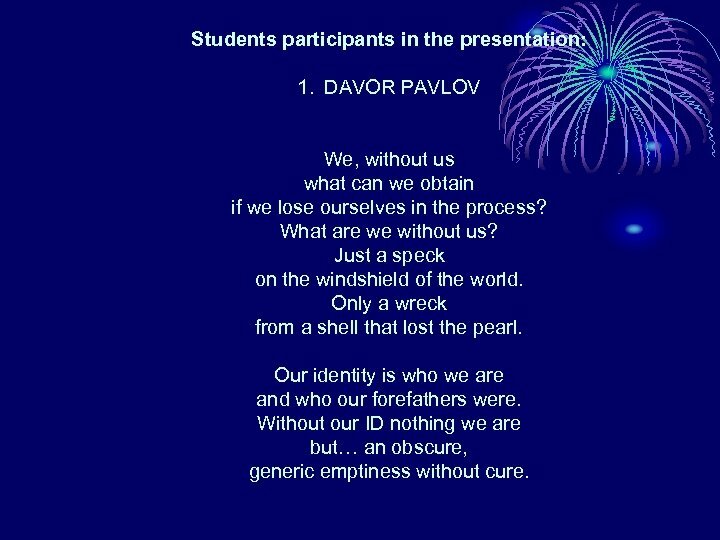 DAVOR PAVLOV We, without us what can we obtain if we lose ourselves in the process? What are we without us? Just a speck on the windshield of the world. Only a wreck from a shell that lost the pearl. Our identity is who we are and who our forefathers were. Without our ID nothing we are but… an obscure, generic emptiness without cure. 2. 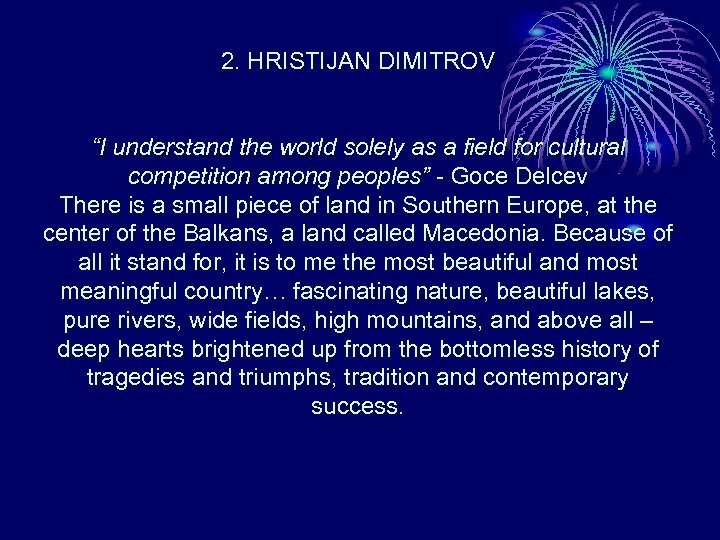 HRISTIJAN DIMITROV “I understand the world solely as a field for cultural competition among peoples” - Goce Delcev There is a small piece of land in Southern Europe, at the center of the Balkans, a land called Macedonia. Because of all it stand for, it is to me the most beautiful and most meaningful country… fascinating nature, beautiful lakes, pure rivers, wide fields, high mountains, and above all – deep hearts brightened up from the bottomless history of tragedies and triumphs, tradition and contemporary success. My Macedonian country is the land of the sun - shining for many cultures, peoples and religions growing together. Macedonia is the motherland of numerous heroes who sacrificed their lives for its freedom. Macedonia is the birthplace of Alexander the Great, of Cyril and Methodius, Tsar Samuel, Goce Delchev - the patron of our university, and countless other leaders throughout the Macedonian and European history and culture. Delcev’s motto for peace, understanding and cooperation in the world is universal, “I understand the world solely as a field for cultural competition among peoples” – is fitting the world today as it did in the 19 th c.
It is never outdated to protect human rights and freedom for all, regardless of their nationality, religion or gender. Delchev was a hero, a national but not nationalistic hero. That is why we, the descendants of Goce Delchev, continue his ideas of intercultural inclusiveness and respect for each other’s Macedonian heritage, on both national and global scale. We should transfer the best testament to our children and grandchildren, so that Delchev’s dream, which is our forefathers’ dream, continues living through the coming Macedonian generations. We should teach our children to love each other, respect and help each other, share their happiness with each other, and oppose war. We should give our successors a chance to have a better world, and always a better life, for they are the ones, who will continue making their own best in the competition among their best minds, for the best goals of mankind. 3. BILJANA ALEKSOVA DANEVSKA For Easter or for Christmas, for other holidays, or for every day – - in God we trust, to God we pray, in America, in Macedonia and everywhere believers live. In this world of globalization, people believe in money and power, but who’s the powerful one? “The one and only, mighty God”, believers would reply. 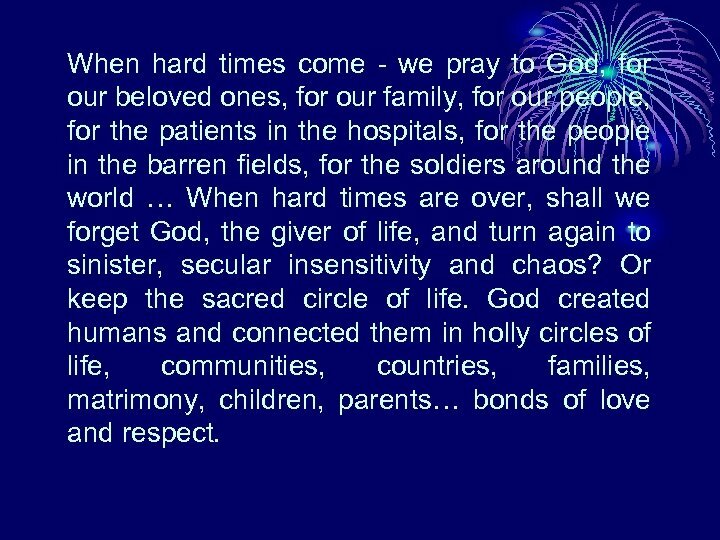 When hard times come - we pray to God, for our beloved ones, for our family, for our people, for the patients in the hospitals, for the people in the barren fields, for the soldiers around the world … When hard times are over, shall we forget God, the giver of life, and turn again to sinister, secular insensitivity and chaos? Or keep the sacred circle of life. God created humans and connected them in holly circles of life, communities, countries, families, matrimony, children, parents… bonds of love and respect. 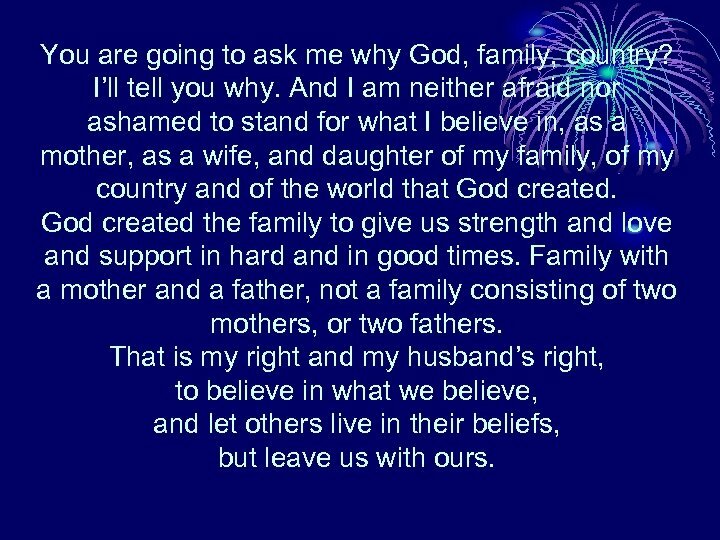 You are going to ask me why God, family, country? I’ll tell you why. And I am neither afraid nor ashamed to stand for what I believe in, as a mother, as a wife, and daughter of my family, of my country and of the world that God created the family to give us strength and love and support in hard and in good times. Family with a mother and a father, not a family consisting of two mothers, or two fathers. That is my right and my husband’s right, to believe in what we believe, and let others live in their beliefs, but leave us with ours. 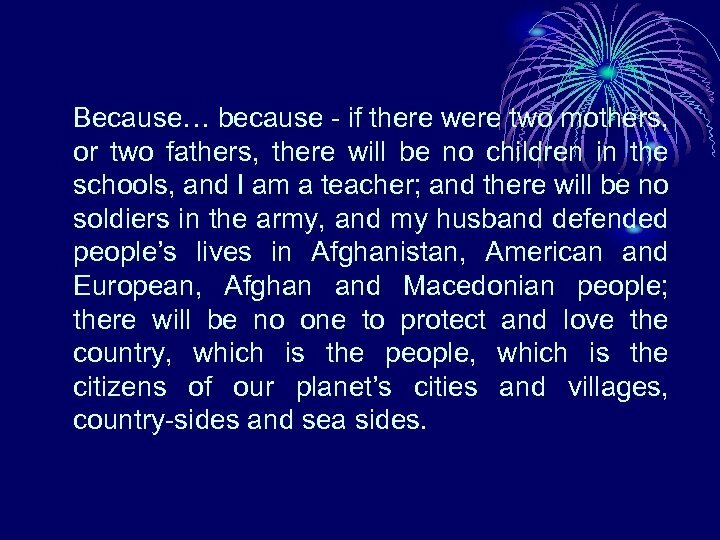 Because… because - if there were two mothers, or two fathers, there will be no children in the schools, and I am a teacher; and there will be no soldiers in the army, and my husband defended people’s lives in Afghanistan, American and European, Afghan and Macedonian people; there will be no one to protect and love the country, which is the people, which is the citizens of our planet’s cities and villages, country-sides and sea sides. To me, and to billions others, the country is sacred as God is, although globalism and trans-nationalism envisions countries in a generic way, without borders or identity. Globalism, as more and more scientists and common citizens react – falls into its own contradictions when protecting cultural identity and integrity while also trying to erase identity and integrity from the traditional concept of a country, family, God. We take an oath of loyalty to our ancestors, to love and protect our country. Presidents of America take that oath too. Our ancestors and our present leaders take that oath as well. I do too. I believe in the one and only all mighty God! I believe in love and family! And I love my county, my Macedonia! 4. 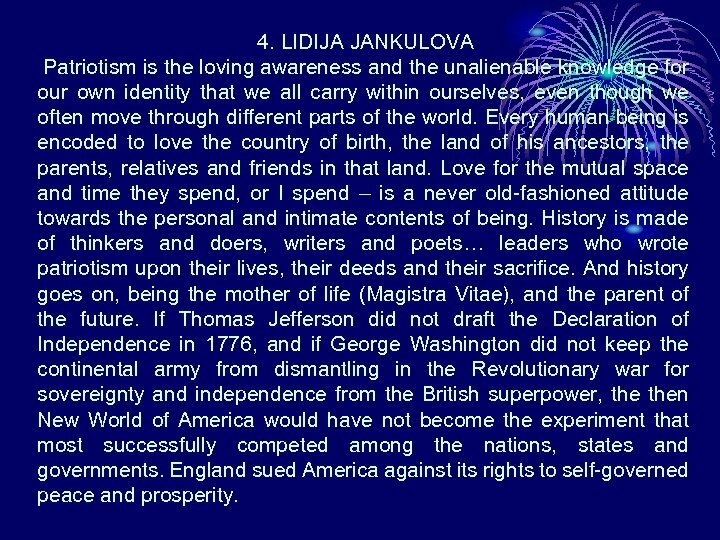 LIDIJA JANKULOVA Patriotism is the loving awareness and the unalienable knowledge for our own identity that we all carry within ourselves, even though we often move through different parts of the world. Every human being is encoded to love the country of birth, the land of his ancestors, the parents, relatives and friends in that land. Love for the mutual space and time they spend, or I spend – is a never old-fashioned attitude towards the personal and intimate contents of being. History is made of thinkers and doers, writers and poets… leaders who wrote patriotism upon their lives, their deeds and their sacrifice. And history goes on, being the mother of life (Magistra Vitae), and the parent of the future. If Thomas Jefferson did not draft the Declaration of Independence in 1776, and if George Washington did not keep the continental army from dismantling in the Revolutionary war for sovereignty and independence from the British superpower, then New World of America would have not become the experiment that most successfully competed among the nations, states and governments. England sued America against its rights to self-governed peace and prosperity. Yet, the new and then still weak country won, and then became the winner of all times. On the other side of the Atlantic, Macedonia was a stage for constant invasions and divisions ever since 168 BC, when the Greeks, the Romans, the Ottomans, and then in the 19 th and the 20 th century again the Greeks, Bulgarians and Serbs, assisted by their sponsors, the European powers, terrorized, massacred, burnt, plundered the Macedonian land its tragic Macedonian people. Yet, we are alive today, living the dream that nations and people from around the world shared in historic road to independence. Today we live our reality, which is no longer a dream. During terrible centuries of brutal aggression and suppression of the Macedonian people, language and culture, our country of Macedonia lost its best sons who led various uprisings, battles and wars for freedom, peace and human rights. A nation should always be a friend with other nations. People should always be ready to cooperate with each other and help the ones in need, benefit spiritually, learning about understand other nations’ prosperity and culture. It is what Goce Delchev had in mind when thinking of uniting the Macedonian nation. The USA has broadly demonstrated to the world that they are the greatest help supplier whenever and wherever needed. We are thoroughly glad to be their friends and cooperators. There are many students from our country who visit the USA during summer and who also work there to pay their stay and even bring some savings back home. America helps foreign students in a lot of other ways, such as all the different programs of part-time studies for the best students in our country. Students from all around the world take these programs and are very content with it. 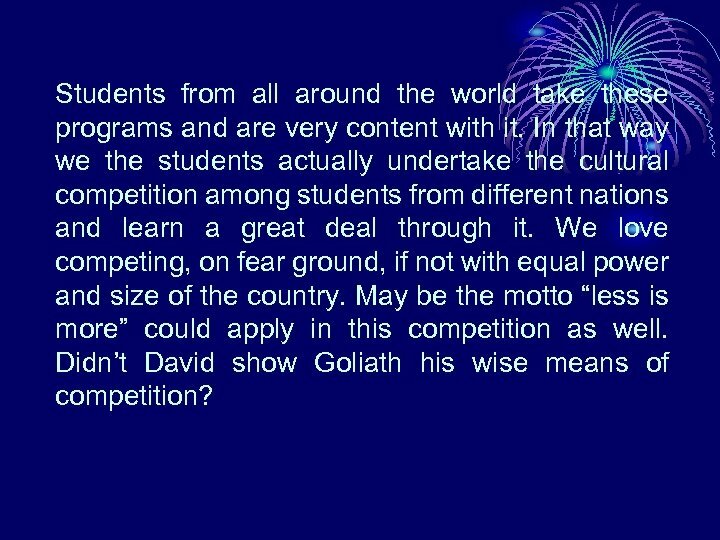 In that way we the students actually undertake the cultural competition among students from different nations and learn a great deal through it. We love competing, on fear ground, if not with equal power and size of the country. May be the motto “less is more” could apply in this competition as well. Didn’t David show Goliath his wise means of competition? 5. IVAN STOJMENOV If there was no goodness, the good old goodness, the world will be just an awful vacuum full of dark forces and residues of destructiveness. I believe that love for your people and your country is giving and sharing, creating opportunities, helping the needy. . . We do not have to be rich to help other people. But if we are not helping others, not even helping ourselves, even God will seem “helpless” for us. I wish that we could all keep helping each other, employing common sense, sharing understanding, sharing the freedom of being creative, constructive and positive, being good, even when evil seems to be overwhelming around all networks or websites today.
. 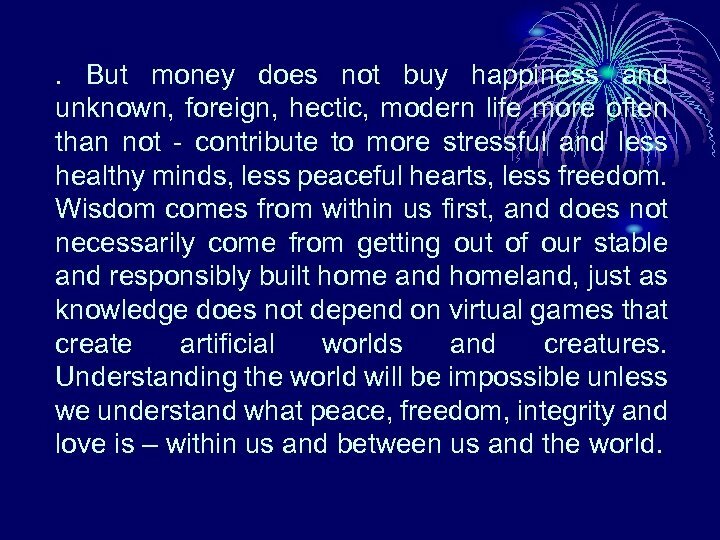 But money does not buy happiness and unknown, foreign, hectic, modern life more often than not - contribute to more stressful and less healthy minds, less peaceful hearts, less freedom. Wisdom comes from within us first, and does not necessarily come from getting out of our stable and responsibly built home and homeland, just as knowledge does not depend on virtual games that create artificial worlds and creatures. Understanding the world will be impossible unless we understand what peace, freedom, integrity and love is – within us and between us and the world. 7. ZORICA ILIEVA Love is the greatest value, the greatest reality on earth, yet not everyone on earth is given the privilege to have it, to comprehend it. All say they have some kind of love in themselves, and maybe they do, but that kind of love looks and feels less and less like godly or humanly love. I have genuine love in me and that is why I can say: A small piece of happiness is in my eye, shining and leading me through the afternoon when everything around is so wrong. There is so much good to do among so much cruelty. And there are so many, so many good people, so many good parents, but so little time to teach the others that negative forces destroy and break - material and spiritual values, undercut our foundations and cut our future growth. 8. 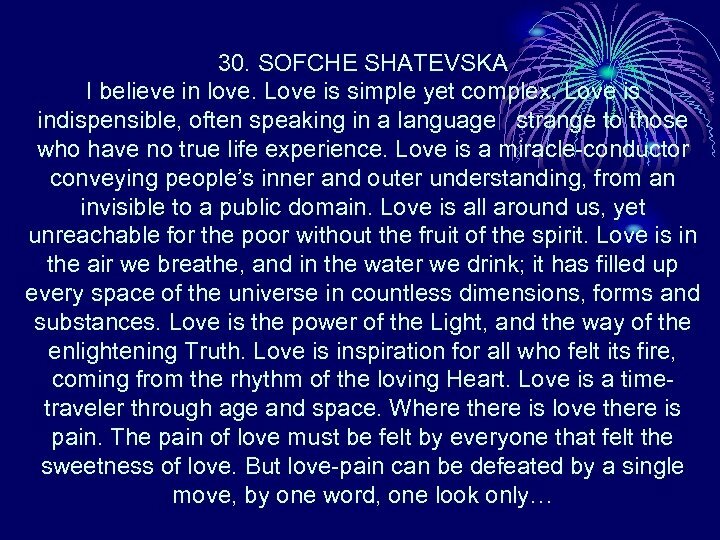 CVETANKA SHEMOVA By nature, people love to travel, to cross the unknown, to expand their horizons. However, being far away from home, or from the homeland, some people get overwhelmed with an unreal feeling of alternative reality. Millions of people go through various processes of change, and many of them get transformed to the extent of having no feelings for belonging to a family or a country. Only those who have not lost the feeling and the connectedness with their family home and their homeland remain capable of loving the most unique values in life: the smell of the snow in the long winter nights in the neighborhood, the smell of flowers in grandma’s garden, the blooming countryside in the Spring, the miracle of the Summer sunset or the power of the Autumn rain pouring in the night, while you happily rest in you “home-sweet-home”, after the hard and honest working hours in your blessed and prosperous country. 9. MILENA GAVRILOVA We should be grateful for having our own place and our own path in this universe, our own home and homeland, and from there – our own direction in creating and developing our own qualities and our own projection in the world. We cannot but have respect for the place we are developing ourselves in, a place which offers endless opportunities at home or abroad. We all have something invisibly worthy in ourselves, to compete with and to celebrate – while building our world. 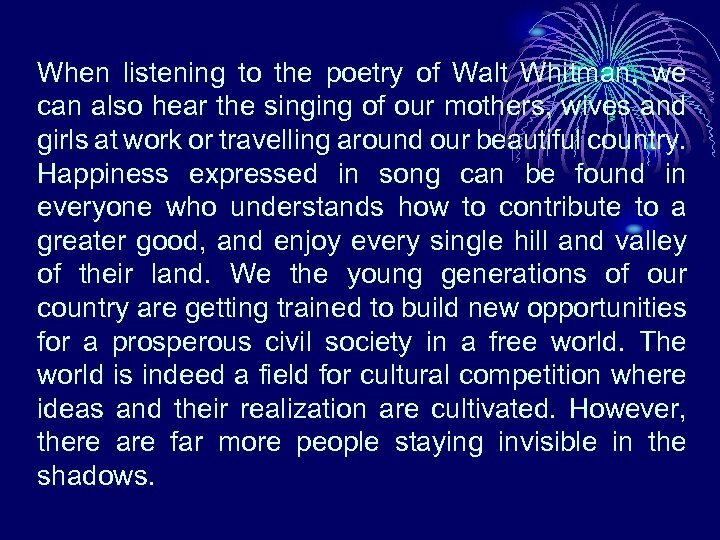 Walt Whitman’s celebration of America’s prosperous new world has a practical and metaphorical meaning transferable to all others, even today. We, the young people of Macedonia, have our own reasons to celebrate, with our own song of Macedonia the Beautiful, Macedonia forever. 10. NENA NACEVA Fatherland (татковина) and mother tongue (мајчин јазик) – two supreme issues of our identity as citizens and as family members. I love my country and I love my parents. Just as my country of Macedonia, my mother is the most loving and the strongest one for me. With my mother I never feel alone or lonely, I never feel I am out of place or out of love. Mother tongue – mother’s love, mother-daughter love… is forever. Diamonds are not forever. 11. MARIJA STOJANOVIC One of the most important goals in life is to know who you are, what your origin is, to know your genes and genealogies that make you aware of your past, present and future life projections. People can take your money, but they cannot take your knowledge or your awareness about yourself. That awareness makes you feel alive as a unique and a distinct personality, as a special part of humanity… Love and respect for what is yours, love for your country, love for your freedom, love for your happy home in your free homeland is what makes you feel uniquely valuable and independent, filled with joy and pride, peace and faithfulness. 12. 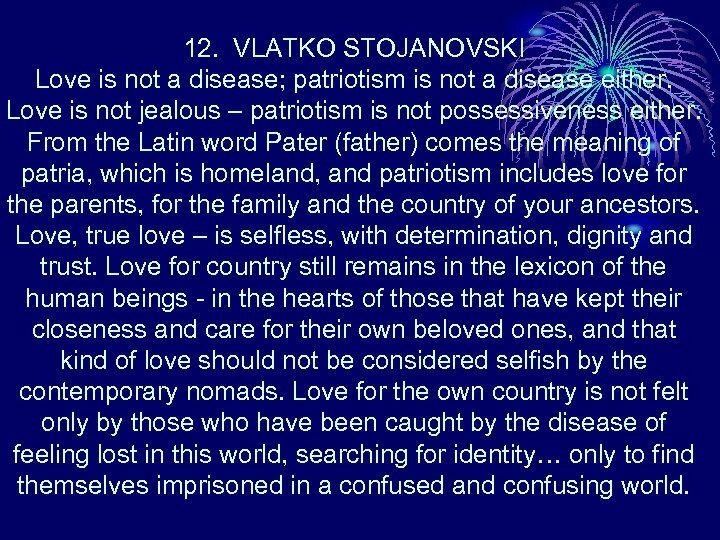 VLATKO STOJANOVSKI Love is not a disease; patriotism is not a disease either. Love is not jealous – patriotism is not possessiveness either. From the Latin word Pater (father) comes the meaning of patria, which is homeland, and patriotism includes love for the parents, for the family and the country of your ancestors. Love, true love – is selfless, with determination, dignity and trust. Love for country still remains in the lexicon of the human beings - in the hearts of those that have kept their closeness and care for their own beloved ones, and that kind of love should not be considered selfish by the contemporary nomads. Love for the own country is not felt only by those who have been caught by the disease of feeling lost in this world, searching for identity… only to find themselves imprisoned in a confused and confusing world. 13. DAVID ATANASOV We all have different opinion, different views of the world and different appreciation of what is to be loved in the world. As for me, I immensely appreciate and love everything that this world has to offer. Yet, what I have acquired in my life, in my own world, in my own country - makes me stronger, more powerful, makes me happier, just by knowing that what I have is given to me out of love, by those during my lifetime and those who lived centuries ago and fought for the freedom and existence of my people, my country, my language, and for me today. 14. 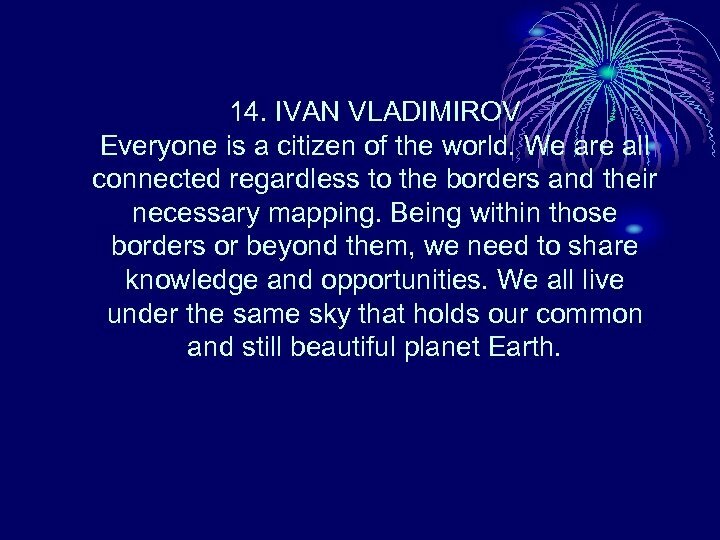 IVAN VLADIMIROV Everyone is a citizen of the world. We are all connected regardless to the borders and their necessary mapping. Being within those borders or beyond them, we need to share knowledge and opportunities. We all live under the same sky that holds our common and still beautiful planet Earth. 15. 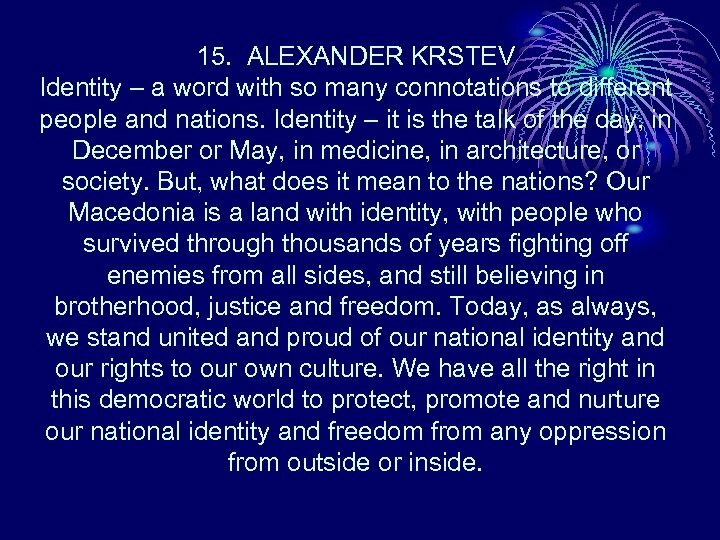 ALEXANDER KRSTEV Identity – a word with so many connotations to different people and nations. Identity – it is the talk of the day, in December or May, in medicine, in architecture, or society. But, what does it mean to the nations? Our Macedonia is a land with identity, with people who survived through thousands of years fighting off enemies from all sides, and still believing in brotherhood, justice and freedom. Today, as always, we stand united and proud of our national identity and our rights to our own culture. We have all the right in this democratic world to protect, promote and nurture our national identity and freedom from any oppression from outside or inside. 16. MIHAIL VELICHKOV Identity of a person, as well as a nation, is essential. It is what we are, and none can take that from us. We the Macedonians are a part of the global community of nations, peoples, clans or tribes, all forms of togetherness with various identities. As such, people function for ages, and without having to invent the idea of globalism they shared the globe as multiple cultures. We have been for ever global and multicultural. Therefore, each person or nation should continue preserving the integrity of the identity which keeps the multicoded existence in the free world. We must be proud of what nature and history made us of, and we must defend our unique values as they are inseparable from the world heritage as they are inseparable from us. We need to know where we come from, in order to protect our road to cooperation with other different identities, without letting them steal our identity, and without stealing anyone’s identity. 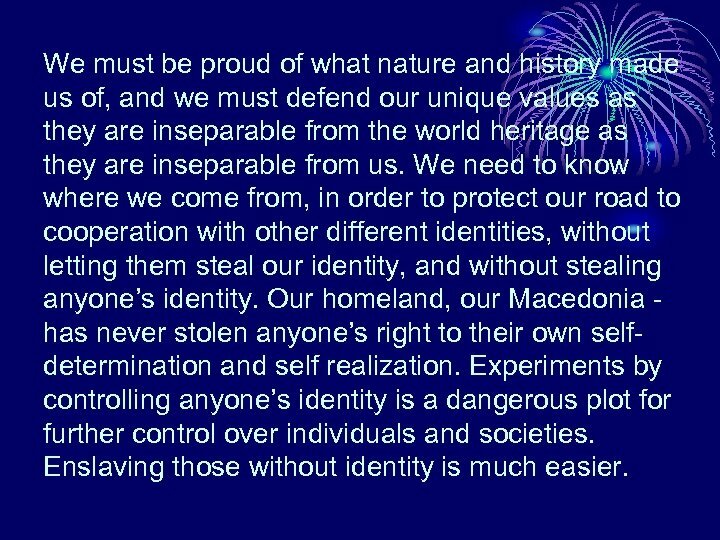 Our homeland, our Macedonia has never stolen anyone’s right to their own selfdetermination and self realization. Experiments by controlling anyone’s identity is a dangerous plot for further control over individuals and societies. Enslaving those without identity is much easier. 17. 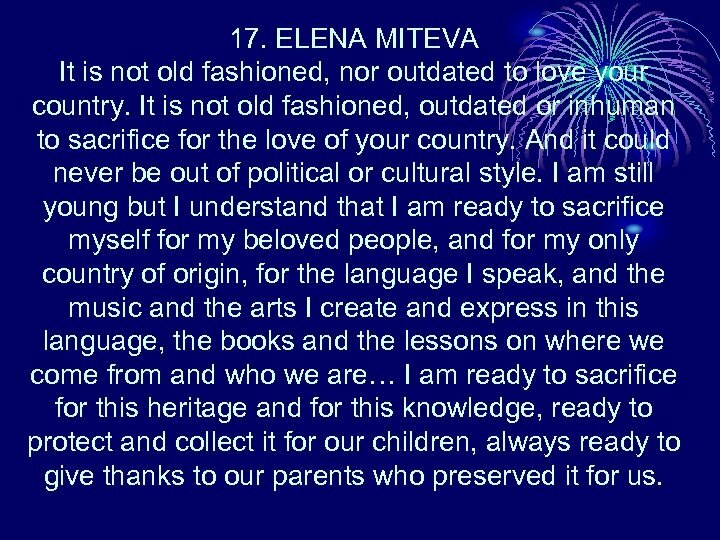 ELENA MITEVA It is not old fashioned, nor outdated to love your country. It is not old fashioned, outdated or inhuman to sacrifice for the love of your country. And it could never be out of political or cultural style. I am still young but I understand that I am ready to sacrifice myself for my beloved people, and for my only country of origin, for the language I speak, and the music and the arts I create and express in this language, the books and the lessons on where we come from and who we are… I am ready to sacrifice for this heritage and for this knowledge, ready to protect and collect it for our children, always ready to give thanks to our parents who preserved it for us. 18. MARTINA PARIZOVA Personal freedom and individual identity is what makes a person different from others. It should not be incorrect, or wrong or unsustainable to be different today, as it has never been natural to go against nature. It is crucially important to have your own opinion, to be yourself, and to not give up your freedom, because without freedom of identity people live in a puppet-cage under the influence of others that dictate what is yours and what not. 19. IVANA PETROVSKA The only difference between merely living and actually loving life is simply the choice between making the right decision and giving it up. A decision to be thankful for each blessing no matter how small, to be positive and happy with what you create, to cultivate a cultural attachment, devotion and loyalty to your home and to your homeland, to have the freedom to invent your own world, to follow your own justifiable and meaningful determination to achieve your highest potentials – is a decision made for the wellbeing of the outer world while you keep achieving the wellbeing of your own responsible and valuable inner self. 20. 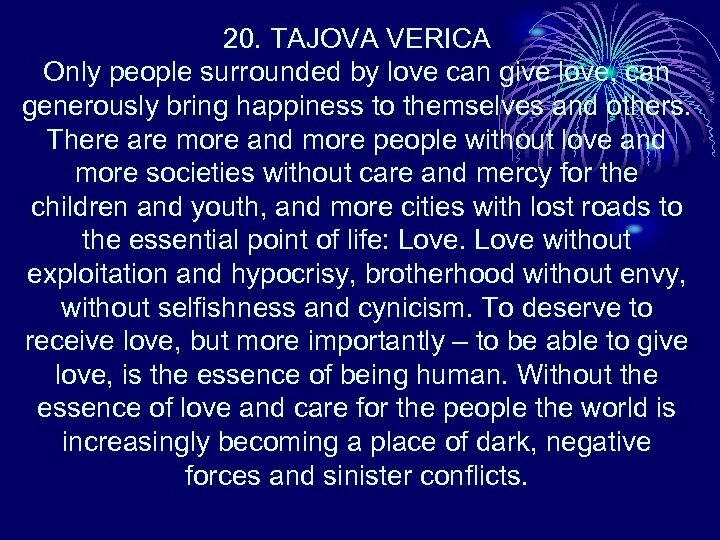 TAJOVA VERICA Only people surrounded by love can give love, can generously bring happiness to themselves and others. There are more and more people without love and more societies without care and mercy for the children and youth, and more cities with lost roads to the essential point of life: Love without exploitation and hypocrisy, brotherhood without envy, without selfishness and cynicism. To deserve to receive love, but more importantly – to be able to give love, is the essence of being human. Without the essence of love and care for the people the world is increasingly becoming a place of dark, negative forces and sinister conflicts. 21. 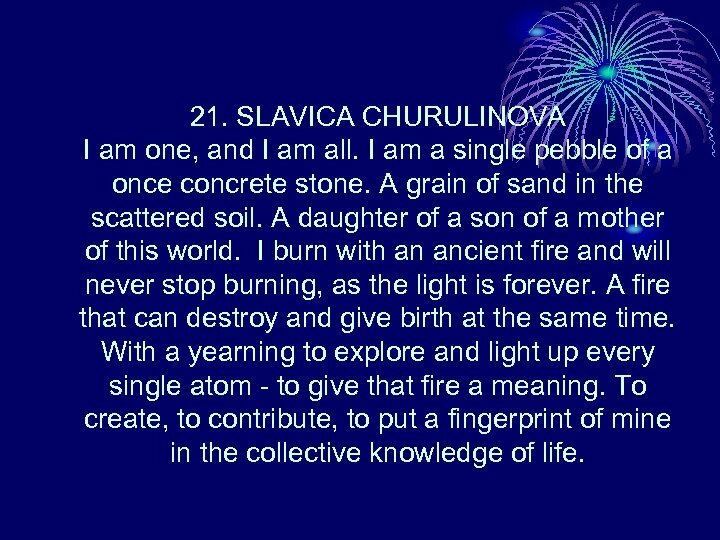 SLAVICA CHURULINOVA I am one, and I am all. I am a single pebble of a once concrete stone. A grain of sand in the scattered soil. A daughter of a son of a mother of this world. I burn with an ancient fire and will never stop burning, as the light is forever. A fire that can destroy and give birth at the same time. With a yearning to explore and light up every single atom - to give that fire a meaning. To create, to contribute, to put a fingerprint of mine in the collective knowledge of life. 22. 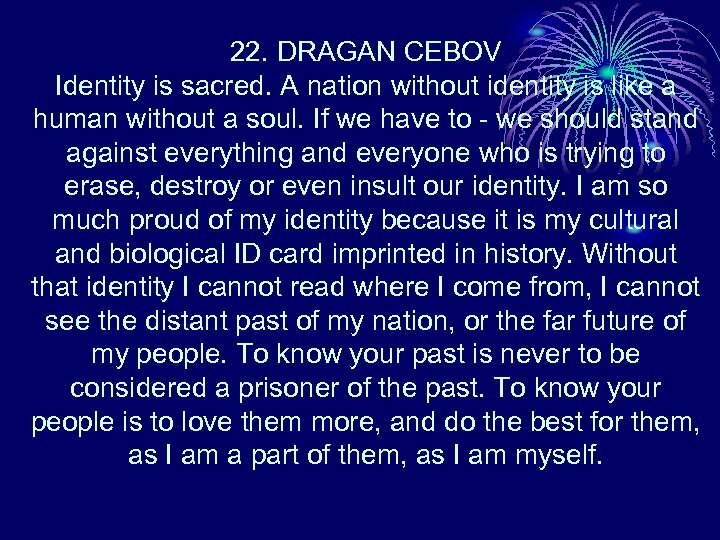 DRAGAN CEBOV Identity is sacred. A nation without identity is like a human without a soul. If we have to - we should stand against everything and everyone who is trying to erase, destroy or even insult our identity. I am so much proud of my identity because it is my cultural and biological ID card imprinted in history. Without that identity I cannot read where I come from, I cannot see the distant past of my nation, or the far future of my people. To know your past is never to be considered a prisoner of the past. To know your people is to love them more, and do the best for them, as I am a part of them, as I am myself. 23. IVANA STOJILOVA Life is an endless school and everyone is going to die after going through life’s schooling, but not everyone will learn the priceless values of family and country, as less and less families pay attention to family relationships, and less people care about love for country. Their primary goal has become material possessions. They forget the wisdom that money can’t buy the essential values in life. Money cannot buy happiness in family life if happiness is destroyed in the search for personal independence. To be independent and still know how to maintain family ties and prosperous connections with your countrymen – that is the greatest treasure of success enriched with happiness, even if you live among less kind, less appreciative people. We should invest ourselves in doing our best to change people into better human beings. 24. 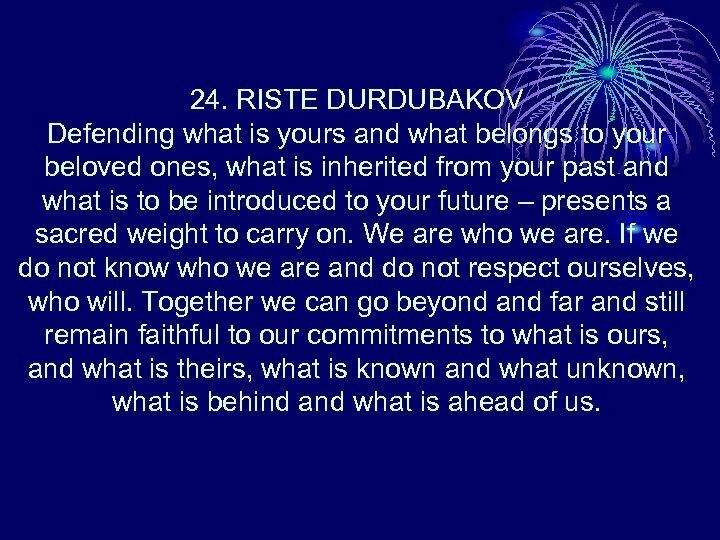 RISTE DURDUBAKOV Defending what is yours and what belongs to your beloved ones, what is inherited from your past and what is to be introduced to your future – presents a sacred weight to carry on. We are who we are. If we do not know who we are and do not respect ourselves, who will. Together we can go beyond and far and still remain faithful to our commitments to what is ours, and what is theirs, what is known and what unknown, what is behind and what is ahead of us. 25. 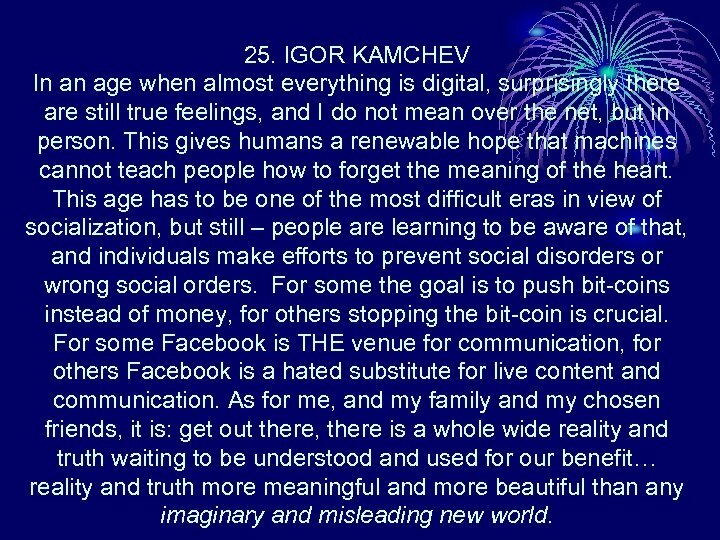 IGOR KAMCHEV In an age when almost everything is digital, surprisingly there are still true feelings, and I do not mean over the net, but in person. This gives humans a renewable hope that machines cannot teach people how to forget the meaning of the heart. This age has to be one of the most difficult eras in view of socialization, but still – people are learning to be aware of that, and individuals make efforts to prevent social disorders or wrong social orders. For some the goal is to push bit-coins instead of money, for others stopping the bit-coin is crucial. For some Facebook is THE venue for communication, for others Facebook is a hated substitute for live content and communication. As for me, and my family and my chosen friends, it is: get out there, there is a whole wide reality and truth waiting to be understood and used for our benefit… reality and truth more meaningful and more beautiful than any imaginary and misleading new world. 26. EMILIJA STOJKOVA Love for country is different than my love for the sun, for the flowers, for my home, my parents, and my friends. But my love for my country makes me happy and fulfilled in a most special way. 27. 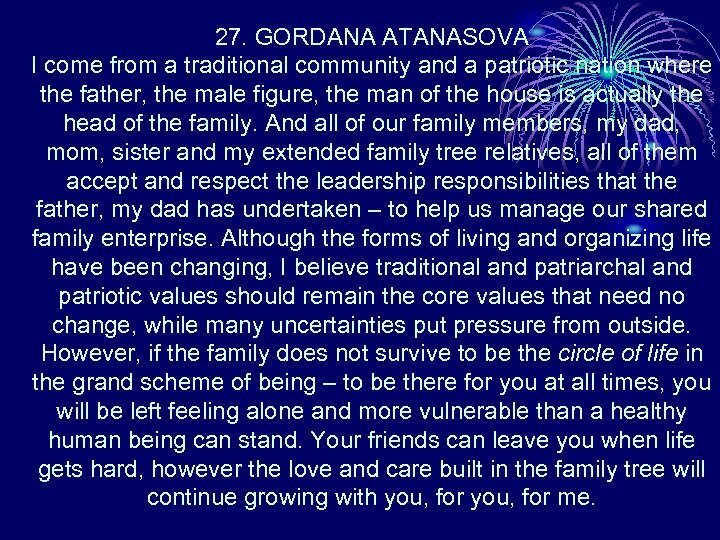 GORDANA ATANASOVA I come from a traditional community and a patriotic nation where the father, the male figure, the man of the house is actually the head of the family. And all of our family members, my dad, mom, sister and my extended family tree relatives, all of them accept and respect the leadership responsibilities that the father, my dad has undertaken – to help us manage our shared family enterprise. Although the forms of living and organizing life have been changing, I believe traditional and patriarchal and patriotic values should remain the core values that need no change, while many uncertainties put pressure from outside. However, if the family does not survive to be the circle of life in the grand scheme of being – to be there for you at all times, you will be left feeling alone and more vulnerable than a healthy human being can stand. Your friends can leave you when life gets hard, however the love and care built in the family tree will continue growing with you, for me. 28. BLAGOJ MILOSHEVSKI The Elders. Each person needs to be loved and supported by the elders who usually gained more decision-making abilities than us, the young ones. Likewise, every person needs to cultivate love and respect for the elders, so that life success through this world comes in better and easier ways. Just like with the elders, every country has its relics that need to be appreciated, protected and secured, by the government, and by us, the people of the country. No one has the right to destroy the national treasures that our elders built. 29. SARA SOKOLOVA What makes a human great? It is not how rich he is but how much richness he creates and contributes to his society, community and family. It’s about his generosity, about his moral wealth, his virtues. It is about his healthy ideas that make a beneficial difference in the world. What makes a nation great? The same matter that makes all men and women great. Human beings can feel the greatness of a nation coming from their spirit. Common men are not so common as other people think they are. Common men are the foundation stone of every successful country. The mechanic, the carpenter, the mason, the boat man, the shoemaker or the woodcutter make a perfect balance of labor that contributes to a vibrant and complex togetherness as people of the land. When listening to the poetry of Walt Whitman, we can also hear the singing of our mothers, wives and girls at work or travelling around our beautiful country. Happiness expressed in song can be found in everyone who understands how to contribute to a greater good, and enjoy every single hill and valley of their land. We the young generations of our country are getting trained to build new opportunities for a prosperous civil society in a free world. The world is indeed a field for cultural competition where ideas and their realization are cultivated. However, there are far more people staying invisible in the shadows. 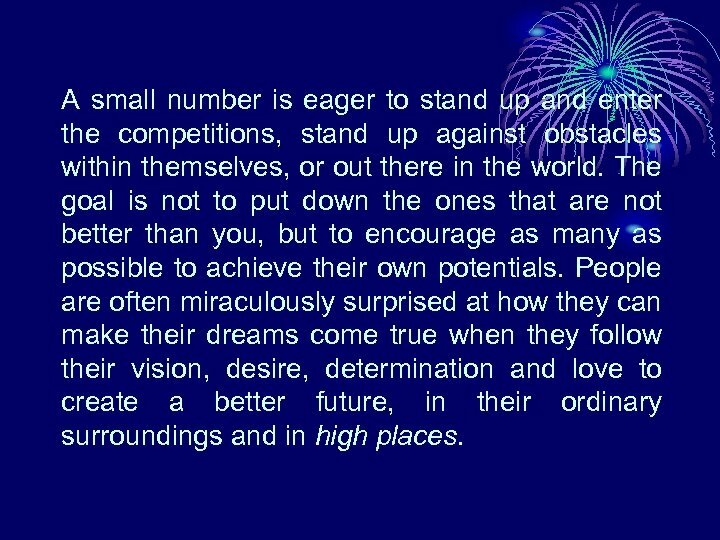 A small number is eager to stand up and enter the competitions, stand up against obstacles within themselves, or out there in the world. The goal is not to put down the ones that are not better than you, but to encourage as many as possible to achieve their own potentials. People are often miraculously surprised at how they can make their dreams come true when they follow their vision, desire, determination and love to create a better future, in their ordinary surroundings and in high places. 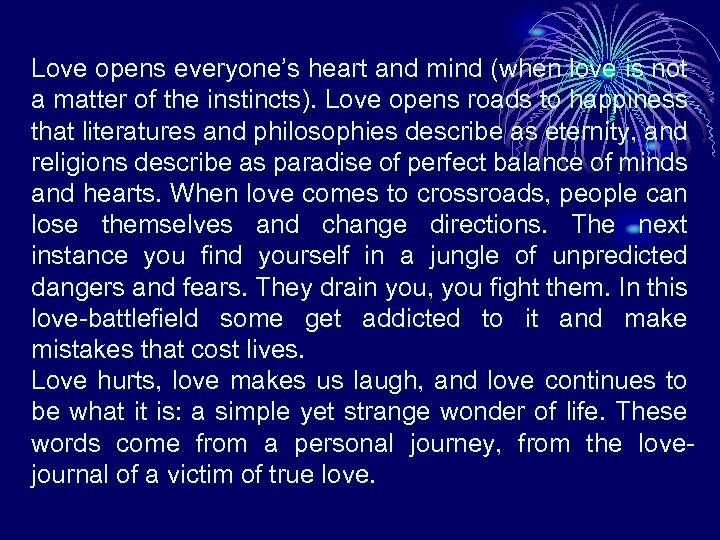 Love opens everyone’s heart and mind (when love is not a matter of the instincts). Love opens roads to happiness that literatures and philosophies describe as eternity, and religions describe as paradise of perfect balance of minds and hearts. When love comes to crossroads, people can lose themselves and change directions. The next instance you find yourself in a jungle of unpredicted dangers and fears. They drain you, you fight them. In this love-battlefield some get addicted to it and make mistakes that cost lives. Love hurts, love makes us laugh, and love continues to be what it is: a simple yet strange wonder of life. These words come from a personal journey, from the lovejournal of a victim of true love. 31. STOJCHE PORJAZOVSKA The world is a rainbow of cultural, religious and linguistic riches, a magic box of traditional and contemporary treasures compiled by all nations and civilizations, enriching our lives. I understand the world as a place where other cultures are another inspiration in addition to my authentic cultural worldview. Your different language of love and understanding is my additional warm coat. I yearn for a world with no pain and tears of despair, a world without hatred, negative rivalry and absurd violence. We should be constantly re-learning the lesson of unlocking the door to understanding, a language that is easily lost as an endangered species. 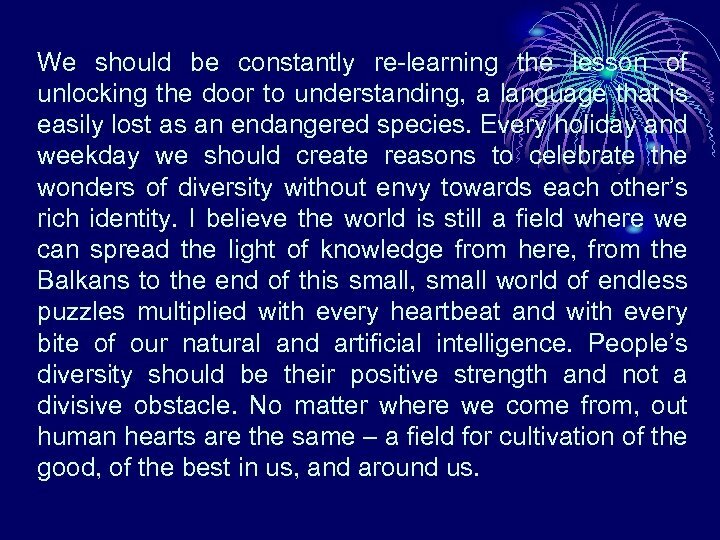 Every holiday and weekday we should create reasons to celebrate the wonders of diversity without envy towards each other’s rich identity. I believe the world is still a field where we can spread the light of knowledge from here, from the Balkans to the end of this small, small world of endless puzzles multiplied with every heartbeat and with every bite of our natural and artificial intelligence. People’s diversity should be their positive strength and not a divisive obstacle. No matter where we come from, out human hearts are the same – a field for cultivation of the good, of the best in us, and around us. 32. DANIEL NASEVSKI Macedonia – the priceless, ageless necklace decorating our Balkan heart: Our sun bathing in the mirror of the Ohrid Crystal water, while Prespa Lake invites you. Vardar is the fearless hero watching the shores From dust to dawn. Shara, Bistra, Belasica or Plachkovica Mountains embrace flower valleys And take over my heart and mind. Every corner of my land is a new dimension of heaven on Earth. Every sight of my beloved country Enters my world With the brightest sun. Where freedom is Where love is There is my beloved Macedonia. 33. DAVOR JAKIMOVSKI To be a patriot - for me isn’t to take a weapon and go to war only. Patriot is the one who makes peace and does good for his people. Patriot is also the baker who makes good bread, the doctor who treats patients… and all other ordinary people who care about the father and the fatherland. Goce Delcev said it in only one sentence – respect people from all over the world and compete with them – in all you know the best: in sciences and sports, inventions and construction, compete in proving your love for your country and your people, make others live better, happier, smarter. That is patriotic for me. 34. ANGELCHO SHTRBEVSKI For some the word patriotic is meaningless, for others it is the key word for the meaning of love for family, country and God. For some people patriotism is the reason to fight for independence and human rights, for others fights for human rights are only a big lie. People who are patriots often tend to be more caring, loving and responsible, people with greater level of common sense, together with high ideals for justice. They understand that family and traditions are one of the most important issues in life that money cannot buy, that military or propaganda force cannot destroy. Patriots respect everyone, but fear no one. 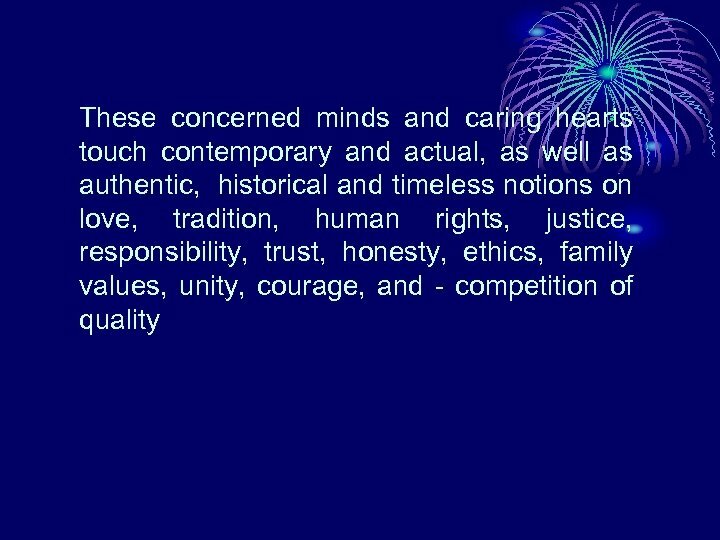 You can find these qualities in our patriot Goce Delcev’s reality-based ideals: I see the world like a battlefield for cultural competition of all nations”. 35. 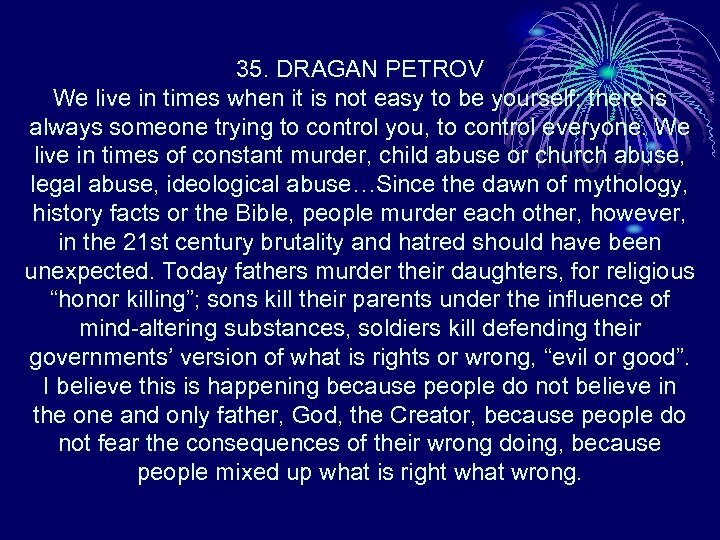 DRAGAN PETROV We live in times when it is not easy to be yourself; there is always someone trying to control you, to control everyone. We live in times of constant murder, child abuse or church abuse, legal abuse, ideological abuse…Since the dawn of mythology, history facts or the Bible, people murder each other, however, in the 21 st century brutality and hatred should have been unexpected. Today fathers murder their daughters, for religious “honor killing”; sons kill their parents under the influence of mind-altering substances, soldiers kill defending their governments’ version of what is rights or wrong, “evil or good”. I believe this is happening because people do not believe in the one and only father, God, the Creator, because people do not fear the consequences of their wrong doing, because people mixed up what is right what wrong. 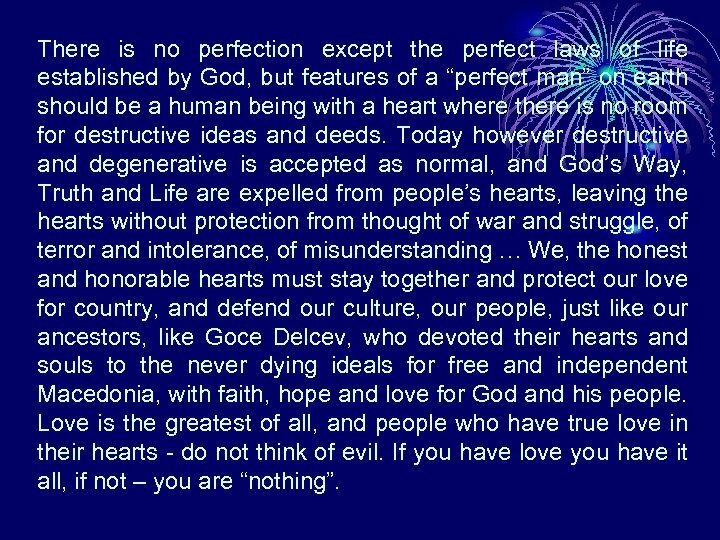 There is no perfection except the perfect laws of life established by God, but features of a “perfect man” on earth should be a human being with a heart where there is no room for destructive ideas and deeds. Today however destructive and degenerative is accepted as normal, and God’s Way, Truth and Life are expelled from people’s hearts, leaving the hearts without protection from thought of war and struggle, of terror and intolerance, of misunderstanding … We, the honest and honorable hearts must stay together and protect our love for country, and defend our culture, our people, just like our ancestors, like Goce Delcev, who devoted their hearts and souls to the never dying ideals for free and independent Macedonia, with faith, hope and love for God and his people. Love is the greatest of all, and people who have true love in their hearts - do not think of evil. If you have love you have it all, if not – you are “nothing”. 36. SASHA JAKIMOV AND PETAR JANGELOVSKI My land bears ancient wounds and sacred secrets Unraveled, still unknown, yet famous in its grandeur. My land - a part contained by all continents. Nothing could prove otherwise. Our wisdom flows from prehistoric roads. My land … blood and tears shed for ages Yet its sinews remain against terror tearing us all apart. True strength lies in handling tough times with mind revolving around patience and perseverance not submitting, not yielding to vicious violence around borders. Not extinguished by terror of all unimaginable pro-portions. Unseen, invisible, grand lies and grand shame did claim piece by piece of our land life, cut off by monstrous invaders from the east, from the west, from the north, the south… competing in eating and burning our sacredness alive. And here we are, again, renewed, strong as ever, a never erased ID, never sold out integrity. Sparks and flames preserved to serve loving, caring aims of our hearts - flames that never extinguish… shining rays of our inner and outer sun.